As your source for high-quality and personalized vision care, Eyes On Norbeck offers a complete suite of services that are designed to be customizable based on your unique visual needs. As we strive to ensure that your comprehensive vision and eye care needs are met, we make it a point to get ourselves up-to-date with the latest technologies and methods in optometry. This allows us to offer a wide range of services. Every successful vision improvement and eye care effort begins with a comprehensive eye exam. Our certified and licensed eye doctors are well-rounded on every aspect of eye examinations, from measuring visual acuity to assessing your eyes for symptoms of eye conditions. 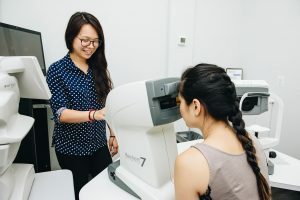 If you are looking for top-notch optometry and eye care services in Rockville, Chevy Chase/Bethesda, Silver Spring, Olney, Potomac, or other surrounding communities, you’ve come to the right place! Get in touch with Eyes On Norbeck today to schedule an appointment for a comprehensive eye exam. You may call us at (301) 238-7199 to talk to one of our staff or leave a message through our contact form and we will get back to you in the soonest time possible.